Nike Air Jordan 11 72-10 Size 11.5 XI Retro 7210 Black 378037-002. Condition is Pre-owned. Shipped with USPS Priority Mail. Nike Retro Air Jordan 11 Low Cherry Red Size 9.5 XI White Varsity 528895-102. Nike Retro Air Jordan 11 Low Cherry Red Size 9.5 XI White Varsity 528895-102. Condition is Pre-owned. Box does have some damage. Shipped with USPS Priority Mail. NIKE SB DUNK LOW TRD QS (420 INTERGALACTIC). w/ Signature Confirmation (no exceptions). Air Jordan 11 XI Retro Legend Blue Comumbia Sz 9 Men's 378037-117 LE. Condition is Pre-owned so look at all photos, to see Condition. Buyer will get exactly what you see in pictures. Original box is not included and shoes will be shipped with USPS Priority Mail. Nike Air Jordan 11 Space Jam XI Retro 378037 003. Condition is New with box. Shipped with USPS Priority Mail. ORGINAL Nike Air Air Force 1 AF 1 '82 CLEAR/GREEN/RED Size 10.5. With wear look at picture 1 cracks. They are cracking all over. Your local artist can repaint. Every picture has wear look at pictures 4,5&6. The pictures i mention has the most wear. Please feel free to contact me if you have any questions or concerns. Please look at all pictures for wear and to be sure. Thanks for stopping happy shopping. White, black, dark concord. The fashionable shoes you see in the photos are the exact stylish sneakers you will receive. Shoes may show signs of aging including discoloration, yellowing, and separation. DEADSTOCK - Nike Mens Air Jordan 11 Retro Size 10.5 Midnight Navy "Win Like 82"
5 out of 5 stars - DEADSTOCK - Nike Mens Air Jordan 11 Retro Size 10.5 Midnight Navy "Win Like 82"
1 product rating1 product ratings - DEADSTOCK - Nike Mens Air Jordan 11 Retro Size 10.5 Midnight Navy "Win Like 82"
AIR JORDAN 1 RETRO HIGH OG ORANGE GATORADE SHOE AJ5997-880 7Y NO TOWEL. Condition is Pre-owned. Shipped with USPS Priority Mail. The shoes are in overall great condition! They are authentic without the box. Pics does reflect the few flaws in the midsole a few scuffing and chafing. Nike Retro Air Jordan 11 Low Cherry Red Size 14. Condition is Pre-owned. Shipped with USPS Priority Mail. 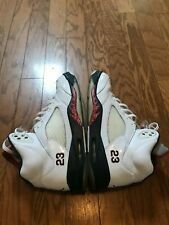 Worn 2 times, a little creasing toward the back of the shoe. Overall in great shape. Does not come with a box. Shoes in EXCELLENT pre owned condition as seen in pics. Minor creasing along the toe box as expected. Plenty of life still left on soles. Do not come w a box. I have for sale a NEW and 100% authentic left shoe of a Nike galaxy dunk low sb size 12. The sneaker is in NEW Condition. OG all will be included. Hello, the shoes are pre-owned and have been worn. The shoes have been taken care of and still have a lot of life left in them. Unfortunately I do not have the box to go with them. These are rare but that’s what everyone says. They are in great conditions with no rips or deformities and the soles have a lot of grip left. Have a good one! You are considering the Nike Air Jordan 1 Retro Basketball Shoes in the pics above. The athletic shoes are in excellent condition. Nike Air Jordan 11 Low. Cherry Red. Used but in good condition! Good condition! No box included, all flaws pictured, there are cuts in the right shoe toebox and they are dirty but have been cleaned up well. This iteration of the NIKE AIR MAX 97 features a Cool Grey upper with Black patent leather mudguard overlays. A White midsole, 3M Reflective trim and a Black rubber outsole completes the design. Never been outdoors. Style Number: 554724 127. Color(s): White. 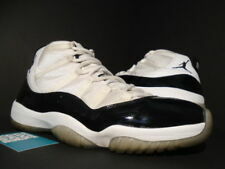 GREAT Air Jordan shoes, 5th Edition repro made in 2011. Insoles are a bit dirty (see pic). Trending at $186.66eBay determines this price through a machine learned model of the product's sale prices within the last 90 days. Rubber outsole with herringbone pattern for traction. isible Air-Sole unit in the heel provides comfortable cushioning, while the partial-bootie construction and articulated heel notch help secure the fit.